Our sleepiness was blown away with the cold air that greeted us as we stepped out of the restaurant. I have found a strange phenomenon occurs when people have full stomachs. While we were looking at souvenirs in the souvenir store across from the soba store, the salesperson offered us some green tea. Accepting the tea, we took things easy for a while and enjoyed some relaxed free time after eating. In the end we left at 3:20pm. The sun sets early when in between mountains. We would be lucky to cover the 25 km to JR Shiojiri Station before it got dark. We left the post town, passed by the front of JR Narai Station, crossed Narai River and reached where Nakasendo overlapped Route 19. 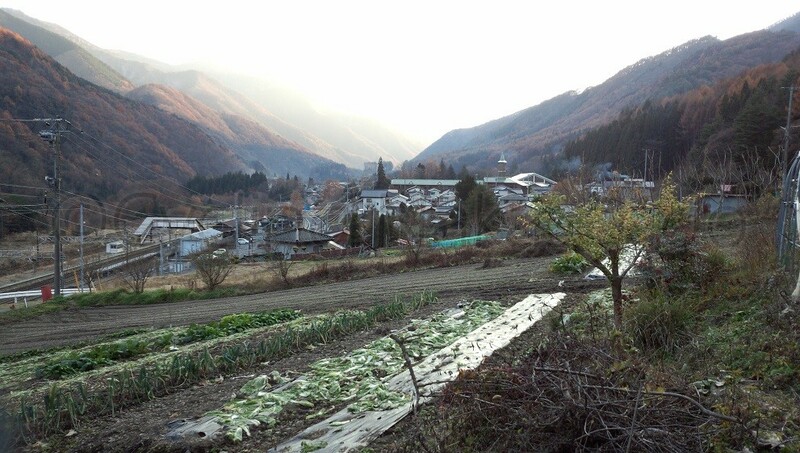 We avoided Route 19 by going along a more pleasant route along the river for 1.1 km and entered Kiso-hirasawa village. From the middle of the Edo era the then small village developed a reputation for producing high quality hinoki and lacquer-ware goods, which ultimately resulted in the wider region developing a robust industry in the production of lacquer-ware. We rode past Kiso-hirasawa and its rows of lacquer-ware stores and ended up at the stairs of Suwa Shrine, which met with Nakasendo. From there we took a detour along a very steep paved road that ran behind “ Michi-no-eki Kiso-narakawa” where we got back on to Route 19 and headed north. 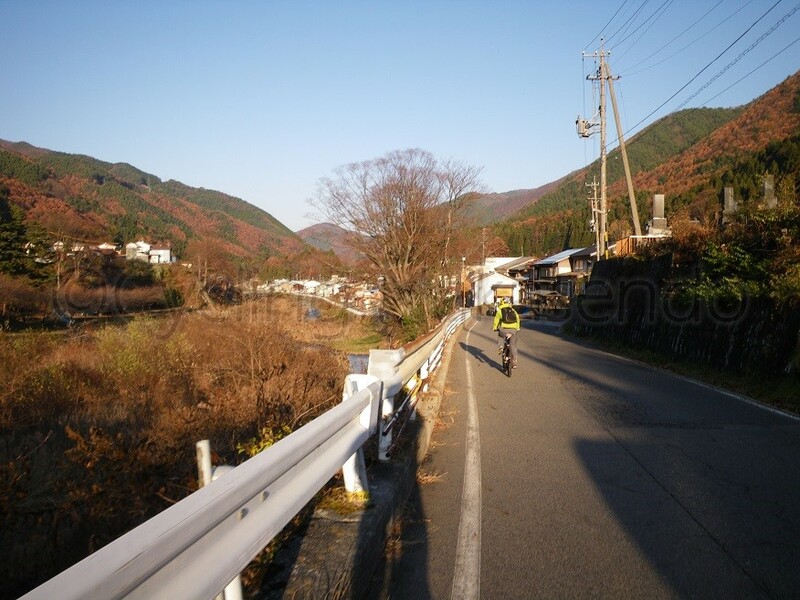 After a while we rode along remnants of Nakasendo, turned right straight after crossing Narai River and got onto another narrow old road that was also Nakasendo that ran between Route 19 and former Route 19. Near the bridge over Narai River was a stone monument where a mile-mound once stood. We headed up into the small village of Momo-oka where we entered the former Route 19 right before a gravel mountain trail. We rode down a road cut into a steep slope and entered the 11th post town on the most northern tip of the Kisoji, Niekawa. Legend has it that in the past, the area was known for its hot springs, which is where it got its name, Nie-kawa (hot-river). Most of the post town was destroyed in a large fire in 1930 meaning remnants of the original town do not exist today. However, a checkpoint at the northern extremity of Niekawa has been rebuilt. This checkpoint was originally built to inspect transport of kisogoboku timber but after the establishment of checkpoint (sekisho) in Kiso-fukushima it was made a sub checkpoint. Until it was closed in 1869 it ran routine inspections for, women and smuggling of firearms across the border, but also of wood and wooden goods that were being transported. 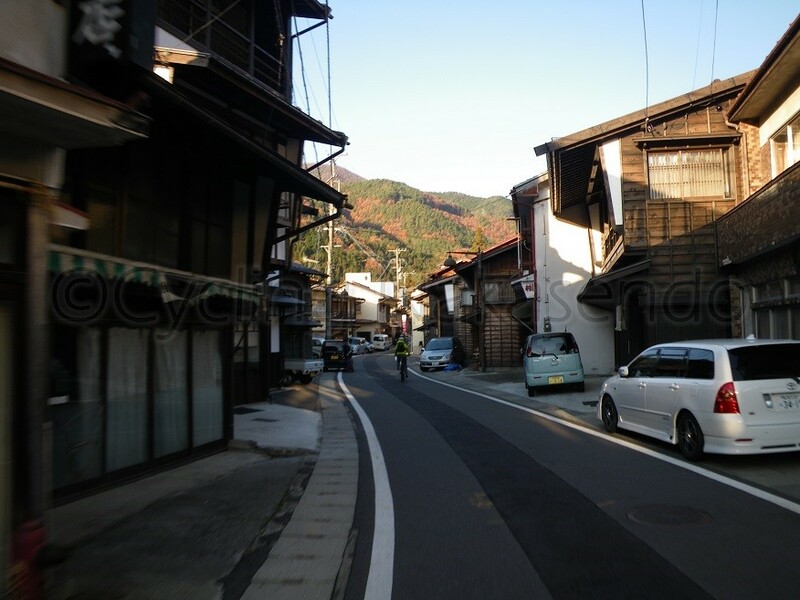 The original Nakasendo that lead from Niekawa’s checkpoint and into the valley has disappeared so we rode for 450 m along Route 19 and headed up the mountain on the left. It was quite a steep incline so I gave up on attempting to ride it, got off my bike and walked, taking pictures as I went. The valley and mountain was veiled in white light as the sun sank behind them, reminiscent of and a reminder that it would soon be winter. After the climb, we continued on an incline of an average of 3% down a series of curves past several houses in a small village then got back onto Route 19. We took in the beautiful scenery of the deep but slender valley carved out by Narai River, eventually coming to a stone monument with the words, “this way is south on Kisoji” at the mouth of a bridge over a small stream of Sakai River. 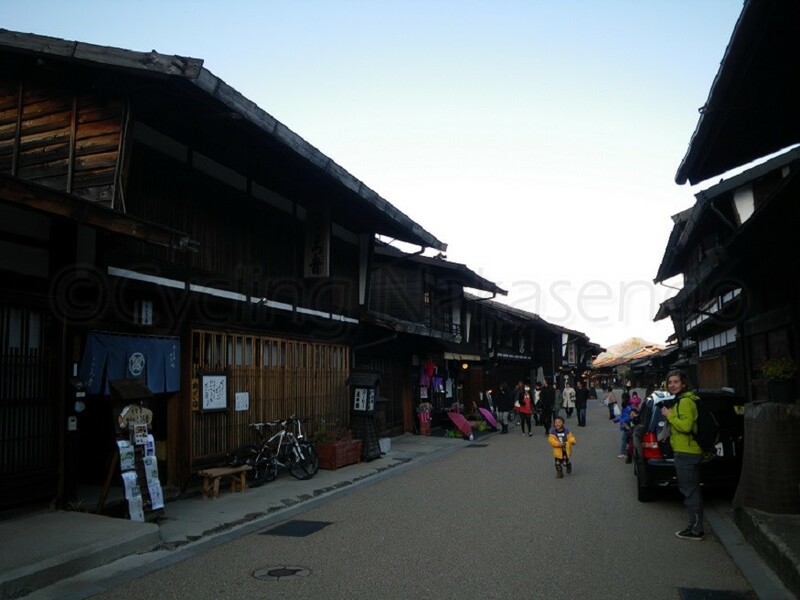 The Kisoji section of Nakasendo finishes here and becomes Shinanoji (The route in Shinano region). Nakasendo appears on the opposite side of Route 19 to the Stone monument as a narrow dirt track wide enough for one person to use. This enabled travelers to avoid the deep valley and get back onto Route 19, which it eventually merged with. From this point there were 13 km left until we reached the day’s destination, Shiojiri Station. After all my worrying, it looked as though we would make it before dark. We completed our journey along Kisoji and continued along Route 19 without fanfare. A sign that explained the beginnings of Nakasendo was at the intersection between Route 19 and Prefectural Route 254. 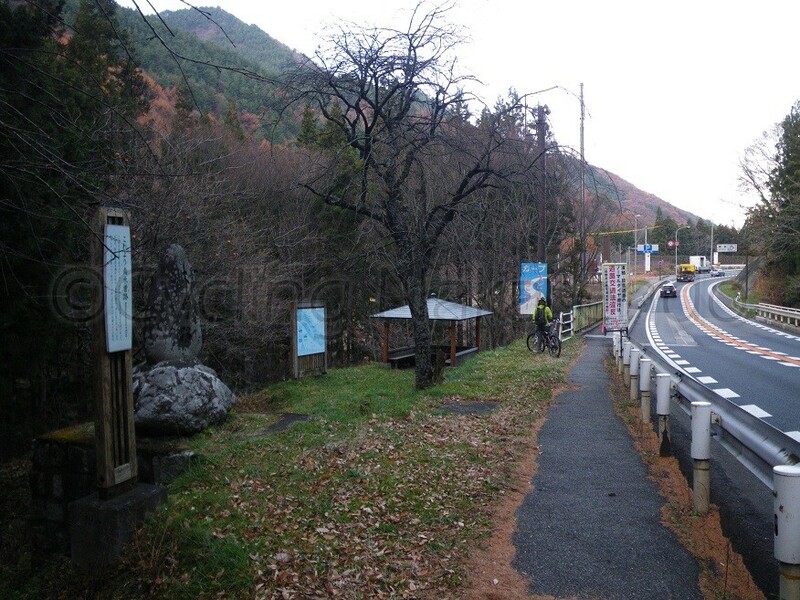 Early on, Nakasendo was changed to pass through Shiojiri. Until 1614 it veered to the right from this point and continued eastwards. We got onto Route 19 by riding through some trees, passed what used to be the village Hideshio via the original Nakasendo and the former Route 19. There is a JR Hideshio Station, but it would be easy to mistake the area for a post town. 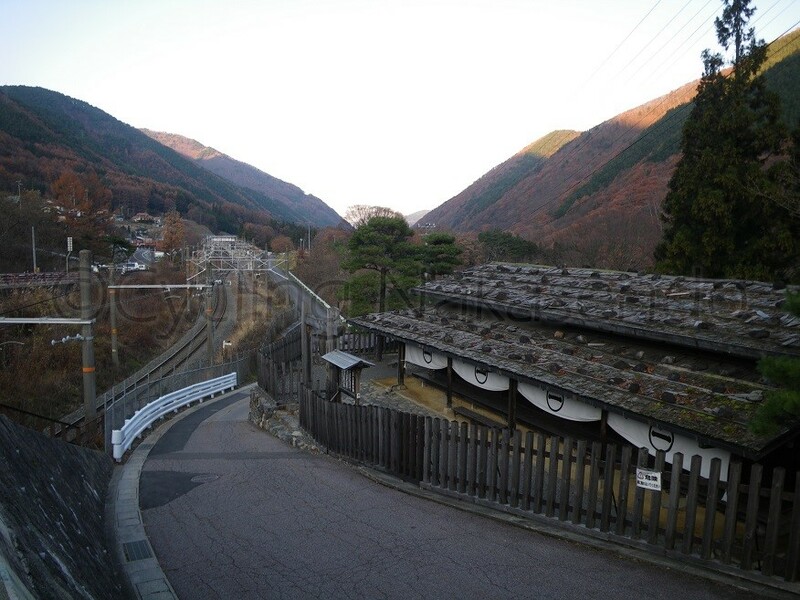 In the past this was a resting station with chaya (cafes that served green tea, lunch and small snacks) and some stores but in the interest of ensuring profit made from travelers was not concentrated in just these areas, staying in resting stations was prohibited by the shogunate. We briskly rode past the quietly lined up houses of what is left of Hideshio, which was probably a decline gradient of 1%. We went down a back street at the foot of an overpass over the train tracks and crossed over a narrow train crossing to re-enter Route 19 and continued downwards. The road started to incline at about the point we rode through Motoyama post town. We entered a double lane road, which is the former Route 19. We continued past what used to be a hatago along the now silent highway due to most traffic avoiding its center by travelling along Route 19. Bathed in the red glow of sunset, the old buildings with signs still mounted on their roof brought on a sense of nostalgia. We continued our descent at an average gradient of 2%. We kept onwards as the decline became 1.5%, after which we rode down into the post town Seba.